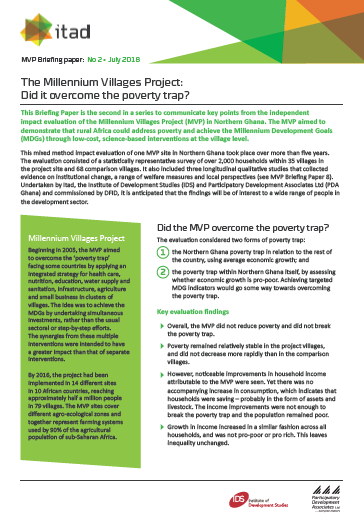 Millennium Villages Project Briefing Paper No.2: Did it overcome the poverty trap? This Briefing Paper is the second in a series to communicate key points from the independent impact evaluation of the Millennium Villages Project (MVP). The MVP aimed to demonstrate that rural Africa could address poverty and achieve the Millennium Development Goals (MDGs) through low-cost, science-based interventions at the village level. the Northern Ghana poverty trap in relation to the rest of the country, using average economic growth. the poverty trap within Northern Ghana itself, by assessing whether economic growth is pro-poor. Achieving targeted MDG indicators would go some way towards overcoming the poverty trap.